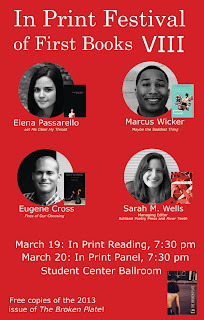 A few posts ago, I talked about all the awesome stuff I learned at Ball State’s In Print Festival of First Books. What I didn’t talk about was my role in the event: I served on a team of literary citizens whose job was to publicize the festival, and in particular, try to shepherd in people from the Muncie, IN community who weren’t students or staff at BSU. This was an interesting challenge for us. Who in Muncie would be interested in this type of event? Where and how could we reach them? We met a few times and tossed around lots of ideas. 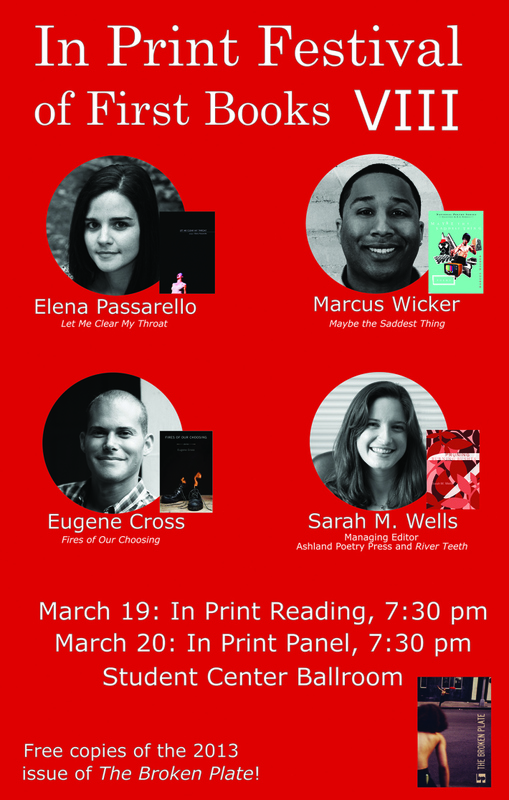 The In Print Festival is primarily of interest to writers, but also to readers who might enjoy meeting and listening to new authors. And where do the cool people (i.e., readers and writers, of course) of Muncie hang out and do their shopping? Downtown! We decided to hang the official posters up all over the downtown area in the hopes of reaching non-college-affiliated eyes. A few of us battled Indiana’s notorious winter weather and made one scouting trip before actually setting out with the posters. The various small and not-so-small business owners were overwhelmingly enthusiastic about not only helping our group but forging a new connection between the campus and the rest of town. We were able to hang posters everywhere from tattoo parlors and bars to craft stores and organic groceries. We made sure that Muncie’s eyes would be on those posters. In order to further promote the event and also give anyone interested in the posters a place to find more information online, one of our team members wrote a piece for the Muncie Voice, an online newspaper, describing the schedule and the authors who would participate. Those are the nuts and bolts of what we did. It’s hard to say how successful we were in pulling in the Muncie community, but either way, the In Print crowd was sizable. For me, the actual tasks and results were not the most important thing. While I did learn something about being a literary citizen by helping to promote other writers, what really came home to me was how important it is to spend time in the company of writers, especially those who are at the same level as you and understand both the struggles and the joys. This is something I wish I had realized a long time ago instead of my senior year in college. If you’re in college or have some other special access to fellow writers, don’t waste it! Not only are they great for talking shop, they’re also, in my experience, some of the coolest (read: most nerdtastic) people in the world. Even though writing itself is a solitary activity, you’re going to need to crawl out of whatever dark space you’re holed up in every once in awhile and talk to real, live people. Writers will get you in a way that others don’t. I had a great time getting to know my team members and I look forward to following their success as writers. My advice: if you have the chance, get involved in the organization of a literary event! It’s a great way to meet people who love books as much as you do. Linda Taylor told me about your blog, so I thought I'd drop by and say hi! How cool that you were involved in this event!